Could you describe what you do and how you earn your living Evan? I publish a website for entrepreneurs, www.EvanCarmichael.com, that attracts hundreds of thousands of visitors every month. I earn money by selling sponsorships and advertising on the website. What’s your number one income stream from your website and why do you think its been so successful? My top income stream has been advertising. Because most of my visitors come through search engines I’ve tested and discovered that advertising is the best business model to follow. You have profiled over 100 top entrepreneurs on your website, what are the benefits of profiling and interviewing famous people? I believe in the concept of Modeling The Masters and just launched a new blog on the topic. The idea is simple: instead of making tons of mistakes yourself, learn from the experiences of people who have already made it and copy their successful strategies. By profiling and interviewing famous people I learn how to be a better entrepreneur as well as educate my readers. 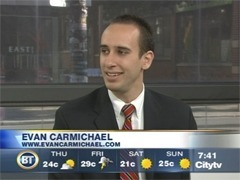 You have appeared in the New York Times, Venture magazine, and on CBC News at 6 and so much more. What advice would you give to other webmasters trying to get noticed by the press? Be relevant and offer yourself up as an expert. Don’t put out a press release about the new product you launched or the new customer you just landed. The media doesn’t care. Find a topic that is really relevant right now and show the media how you can provide insight into what’s going on. The media is always looking for people to comment and be experts so if you positionyourself properly you’ll be helping them out. What advice would you offer a blogger trying to make more money from their blog? Advertising doesn’t work too well for blogs because you get repeat visitors and repeat visitors don’t click on ads. If you don’t get clicks then you lose your advertisers pretty quickly and you won’t make much from programs like Google AdSense. Repeat visitors have “banner blindness” so your better bet is to leverage the relationship you build with them. You can sell your own products to them or affiliate products. Remember that you have to believe in the products because they’re only buying on your advice. If you recommend products that don’t work you’ll lose your audience. You are known as the authority website in the niche, Entrepreneurship. What advice would you give a new blogger to dominating their niche? Make sure you can profit from it. 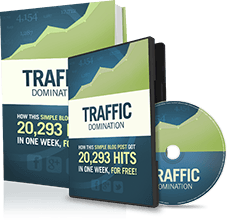 It’s great to dominate your niche but it has to be something that people are willing to pay money for if you’re hoping to make a business from your website. Are people searching for what you have? Are people spending money in your niche? What shouldn’t bloggers be doing when monetizing their blog? Which monetization technique do you dislike the most and why? I’d encourage people to try out as many different forms of revenue generation as possible. Try selling advertisements. Try Google AdSense or the other networks. Try affiliate programs. Try selling your own product. Try creating your own Mastermind group service. Try selling a subscription or premium content. See what sticks. Just make sure that you believe in what you’re selling. Don’t risk losing the relationship you build with your viewers because you are recommending poor products. Work on it every day. It’s better to spend one hour every day for the next 48 days than to spend the next 48 hours going crazy on your website. It takes time to get picked up in the search engines and to build momentum. Most new business owners give up too early. I would say to commit to doing at least one hour per day for the next 90 days (including weekends). Don’t take a single day off in those first 90 days and your business will reward you when you’ve finished the startup process. Don’t give up! Bring on help faster. I did too much myself – too much bad coding, too many late hours, too much guessing. It’s better to hire someone who is good at what they do even if it’s only for a couple of hours to make sure it’s done properly. I now have much more time to do the projects I really enjoy and I also make more money. My first goal was to be the most popular website for entrepreneurs in Canada and I hit that pretty quickly. The next big goal is to be the most popular website for entrepreneurs in the world. We’ve still got a lot of climbing to do and are up against some very big players but how fun is business if you’re not chasing a big goal? Thanks for allowing me to share Michael – best of luck with the new site. I know it will be a huge success! Very good interview as always! Another great interview Michael, it’s great seeing this place kick-off the way it has! It’s amazing that more and more “internet personalities” are doing TV interviews and being recognised for what they do. I keep looking at all of the “make money on the internet” blogs and they always seem to do the same thing, i.e. buy my ebook now and make $12’337 in your first month etc. Evan says to sell premium content in the same way that Envato does with psdtuts, nettuts etc. Takes a while to get there, to get the readership etc. I Liked his comments on the media, its giving me all sorts of ideas. Good thing too as i could not write a press release. I agree with Gavin, I also like how ‘internet personalities’ and beginning to make public appearances. I totally agree James, I guess this is how MoneySavingExpert.com did it, they don’t want to know about his success but rather how he help their viewers!